a leading sire in Germany with a breeding index of 166 points. 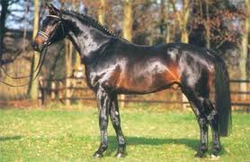 Florestan consistantly has sired top class dressage winners like Ferrara S, Floriano Deut and Floriano. Friendship's dam, Domane, was sired by Diamantino, the Westfalen winner of the Stallion Performance Test, DLG champion and sire of many approved sons. He is a representative of the Duellant Hanoverian line, long esteemed as a source of beautiful movers. Height: 169 cm / 16.2 1/2 h.h.